We are big *Book Worms* in our house. It's not just about the story, the illustrations, or the beauty of the book itself as a thing of enjoyment .... it's also the together time, the cuddles and the fun, all whilst little minds are absorbing and learning. And we are spoilt for choice! I am pretty sure we have all the nostalgic classics, including collections like Beatrix Potter and the Mr Men, as well as a healthy collection of modern classics, like the Julia Donaldson stories. But, I just love discovering new books. Particularly books that are different and that I haven't heard of. So when Laurence King Publishing sent us their Children's Catalogue a little while back, well, I was excited! The books have now arrived! Oh my they are lovely. This is no normal book! It's a giant painting book, full of inspiration and fun. 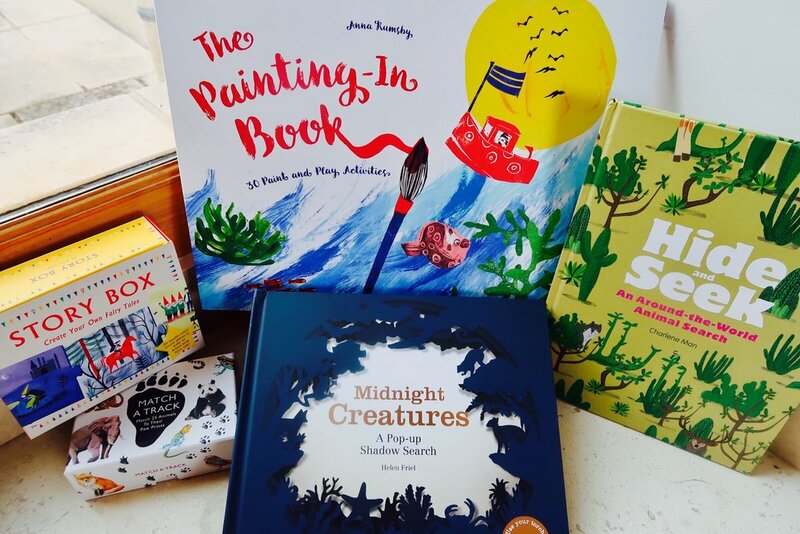 When I first saw The Painting-In Book I did wonder if it might be a bit too old for my children (3 and 2) who mostly splodge paint around a page! But upon closer inspection and some testing out by them - it's just absolutely perfect. Much older children would be engaged and entertained by it too I think. I love it. It's superb quality. Ideal for the holidays. And the big pages can be detached from the book/art-pad so both my children can create together. This is a gorgeous and imaginative product and so much fun! By doing 4 pages between them in their first sitting, they have learnt blending colours, creating texture, hand printing, and my younger daughter correctly identified some colours she was using. I really heartily recommend this art book, and it would make a superb gift too. This book is exactly what you would expect from the title, with an animal from around the world hiding in each beautifully illustrated double page spread. It's very attractive and there is something pleasingly tactile about the cover. When we first opened the parcel from Laurence King Publishing I did have my reservations about the longevity of this book - as once the hidden animal has been found on each page I wondered if its novelty would pass. Well...not yet. My son really likes it and keeps going back to read again. And he can read/do it on his own too, enjoying the autonomy. He loves animals. WE love animals! So he is really keen to talk about them with me and refer back to the map at the front of the book showing where they all come from. Indeed last weekend he chose it to read with his daddy and his little sister got involved too. It was really sweet to observe them all enjoying it together. This unique book would appeal to a wide age range, probably starting around age 3, to get the best from it. Of all the lovely books Laurence King Publishing sent us, this was the one I was most excited to try out with my son. He is at the very beginning of exploring shadows and finds the concept completely captivating. Equipment: You do need a torch! It did not disappoint. I wish I could have bottled his joy and interest and inquisitive reaction to this book. I couldn't film it as we were in the dark!! And, to be quite frank, I wouldn't have wanted to purely because it was one of those touching mummy/child experiences that I was in the moment enjoying. His verdict: "mummy, this is my favourite book". I really think that this is a must have on the book shelves as it's so different and was a massive hit. Again, this would make a lovely gift. Big thumbs up from us. The next "book" we were sent was not actually a book at all. 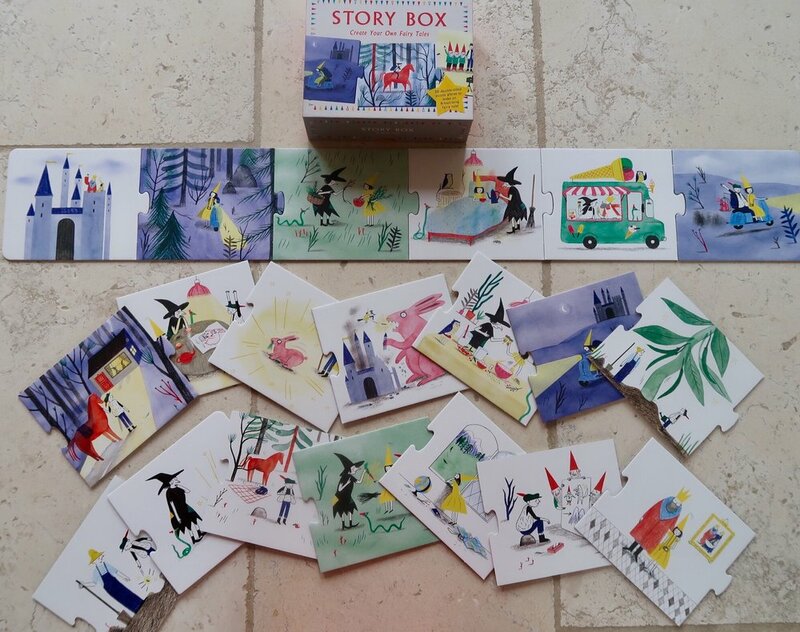 It was a story box and a puzzle all in one! Curious? I was. So, how it works is you have all sorts of pictures on both sides of the puzzle pieces and you effectively arrange them into your own story board. Then, inspired by the sequence of illustrations you have created, you tell a "story from your head" (as we like to call them!) I often tell stories from my head to my children...but this structure and inspiration is most welcome! It helps that in the last few weeks my 3 year old son's imagination has been developing on overdrive. His favourite thing is to pretend, and I just knew this would be a big hit with him. He joined in making up stories after he had seen me doing it a few times. And even my 2 year old daughter (who is quite the wriggler, and only sits down for a "traditional" type story if she loves it AND is in the mood) was engaged by the creative concept and the story she had helped put together. We liked this so much that we are taking it on holiday with us, instead of packing several different story books. And whilst I think of it, it'll be great to take camping as well! Match a Track is more of a game than a book. It is SERIOUSLY cool. I think it's aimed at children..... but frankly I love it. This one is coming on holiday too for my sister and I! My 3 year old son was interested in the idea of it, but playing it properly was a little bit beyond him. 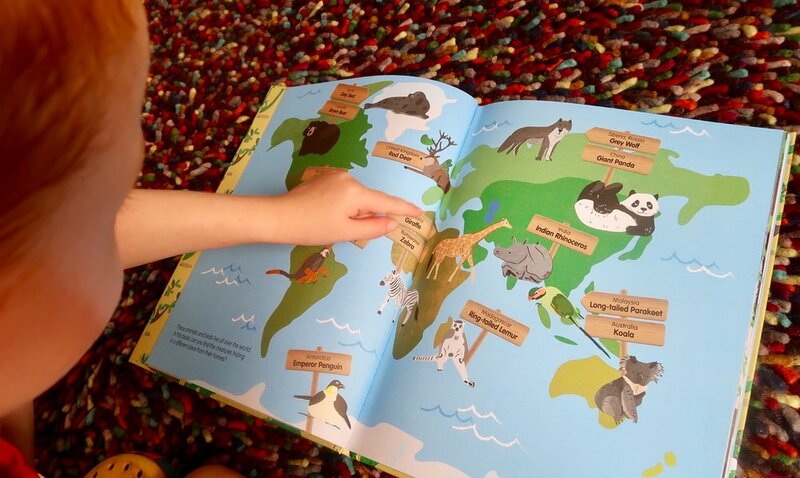 The quality is high, from the packaging to the illustrations, and it's a great introduction to animal tracks. We've all had fun with the animal pictures and introducing the idea and I really do think it will last for many years. The above are just a small selection of the gorgeous books available from Laurence King Publishing's website . They are definitely a great place to go to find reading material and gifts that are of superb quality and a little bit different. P.S. Laurence King Publishing are based in London but they ship worldwide. UK postage is free of charge. And you can find their international delivery charges here. P.P.S. We were sent the books featured above for the purposes of an honest review. All views expressed are, as always, my own.